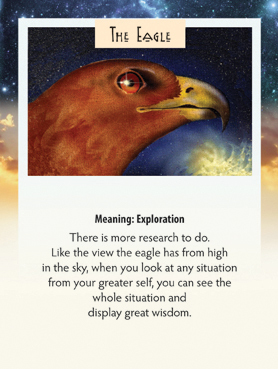 This week we have drawn the Eagle card. The eagle has been used as a symbol for Scorpio, after it has risen out of the ashes of a bad situation….to a new higher level of understanding. What this card is asking us to do is to “rise above” any situations we encounter this week. The eagle has a very powerful vision to see the smallest details from a great distance. That makes him a good hunter. That ability is what can make us good hunters of accurate details to better understand any given situation. Sometimes stepping further back allows us to actually see more details, even though we are further away. As a graphic designer, I have to constantly focus in on the smallest details of precise measurements, but then have to stand back and look at the balance of the whole page. So this week, practice standing back to look at the details…expand the depth of field of your vision.